Way over on the Eastern side of the Sierras, along a dry and dusty road, the ghost town of Bodie sits in desolation amongst the arid foothills. 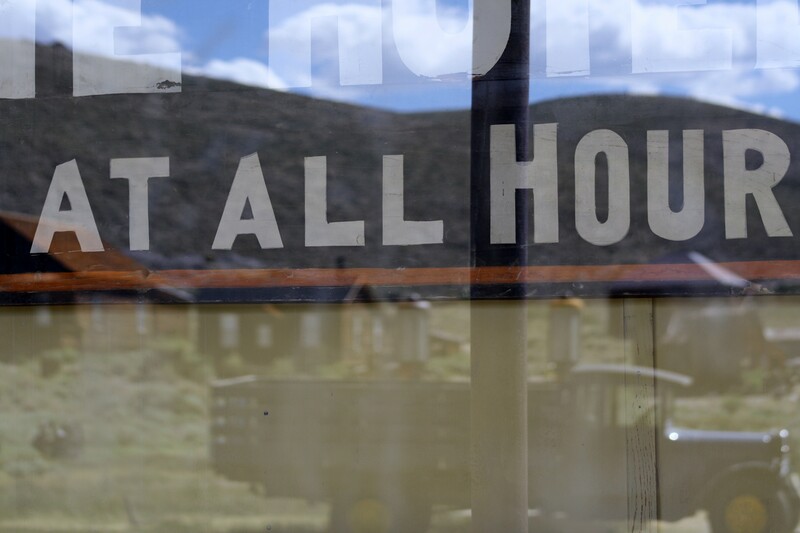 Getting to Bodie is a challenge in itself, 13 miles of a pot-holed, wash-boarded, gravel-pelting road that leaves left us feeling all shakey and jittery upon arriving in the ghost town. Bodie was a mining town and in its glory days boasted a population of over 10,000 people. My boys and I had made the trek to Bodie several years ago. I have an almost obsessive fascination with the paranormal, and I have dragged my poor family with me to see these sights. This particular trip, we told my husband we were going on walk-about and we would be back in several days. He chose to stay home with the dogs. We drove through Yosemite to the Eastern side of the Sierras. On our way to Bodie, we stopped at Mono Lake which is in itself a very strange place. 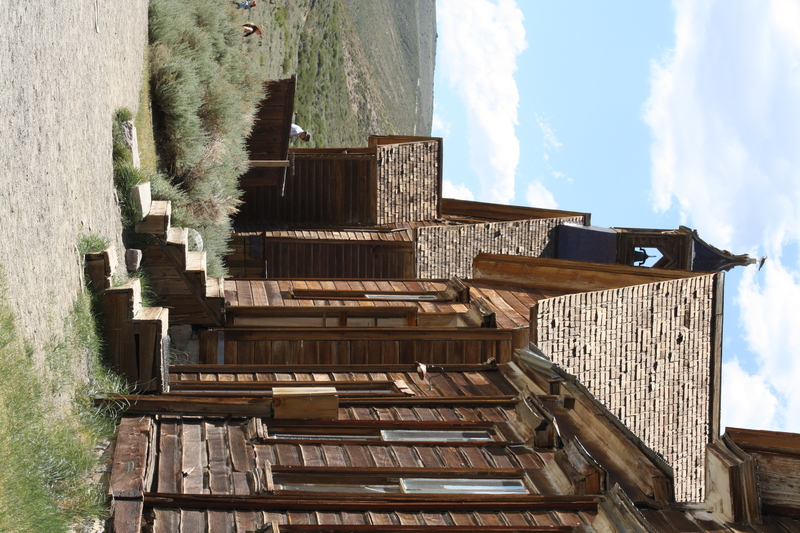 We then made the arduous trip up to Bodie. As we drove along that 13 mile stretch of tarred hell, I couldn’t help but imagine what it was like for the town residents and visitors to travel that same road on horseback or in a wagon. It must have been brutal! 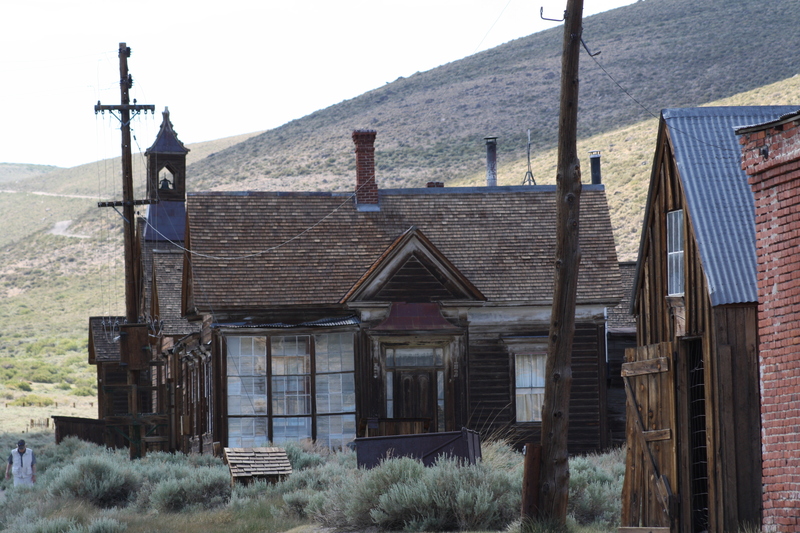 The town of Bodie is out in the middle of nowhere. It is situated in the high desert, which means it is really dry and hot, and at altitude. We climbed out of the car and the wind blowing was as hot as air from a furnace. There were no trees anywhere. Everything was brown, brown buildings, brown grass – nothing green. Just dry, wooden buildings plunked down in total isolation, almost suffocatingly depressing isolation. On the walk from the car park to the actual town center, the sun beat down on our backs and our mouths became parched, because of the dust, the arid air devoid of any humidity. When we came into the town center, it was as if we had stumbled into another era. 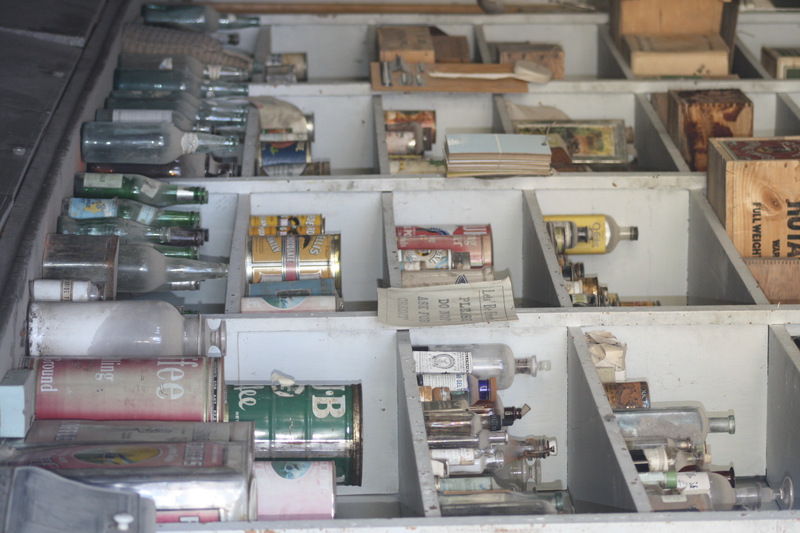 The stores still had merchandise on the shelves, the schoolhouse still had maps on the wall, and the kitchen still had places set for breakfast. 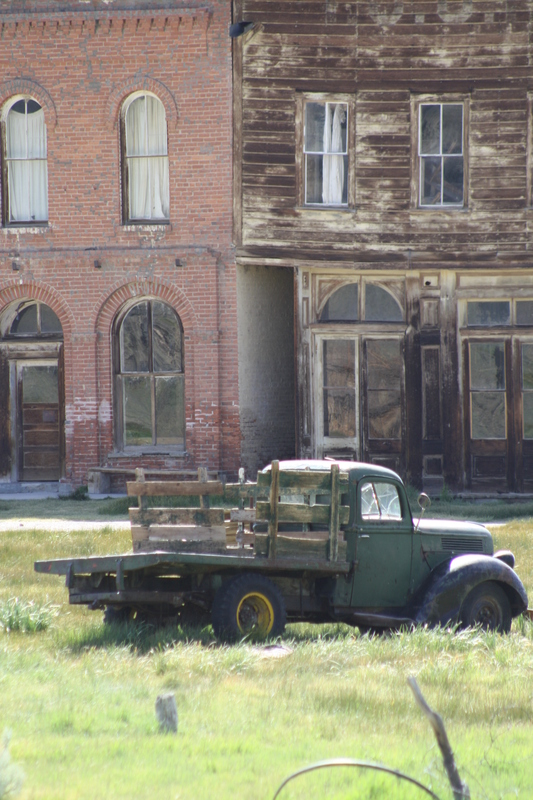 It wasn’t really ever clear why the people of Bodie just walked away from everything. But they did and it is all there for the taking (if one felt so inclined). The Park Service maintains Bodie, in ‘arrested decay’, which is an interesting term and seems completely appropriate for this ghost town. There were only a few Park Service Rangers there, the day we went to Bodie, so we were allowed to wander around, through the buildings, exploring on our own. It’s not surprising visitors take little mementos. Personally I think it is rude, and it seems maybe the ghosts of Bodie do, as well. There are many more letters that portray the same sense of desperation and remorse. It’s hard to believe in this day and age, there is things such as curses, but I can assure you, while we were at Bodie, we didn’t touch a thing. I have always been interested in the paranormal, even as a little kid, but after living in that house I started really becoming fascinated with it. Bodie is such an amazing place, because you can stand amongst all those buildings and almost hear the activity from the past. The town has a dark history because of all the people that were there to just get rich, such violence and in the end such desperation. And all of that seems to reverberate off the buildings which remain. My boys felt it too, we kind of walked around whispering to one another, when we were visiting Bodie, almost as if we sensed whatever was there might easily be angered. Take lots of water, and go in a car with great suspension, Also stop by Mono Lake with the Tufas, very cool, almost looks like something off a moonscape. The Devils Postpile is over there as well, a collection of columnar basalt, supposed to be a geological rarity. The whole area over there is weird, on the eastern side of the Sierras. Fascinating though! Of course you are off to Egypt, how much more exciting can you get, Pyramids, ancient history, scribes in the streets of Cairo (wonder if they get much business, with text messaging and all of that?). Sounds like such a fascinating area and so different which I usually like. I will have to keep it mind for a trip sometime. It is really worth the trip!!! Oh my gosh, when we went to Alcatraz I was completely creeped out. I was standing by one of the cells, with my back to it, and my youngest was at my side. We were listing to those audio tape things they give to you and suddenly, from my right, I hear “Hey”. A grumbly, raspy “Hey”, I could feel the breath on the back of my neck. I jumped so fast, and my son heard it as well. Of course my husband and my oldest thought we both made it up. I want to go back for one of their night tours, but I don’t know I might be too chicken. Went to the Winchester House, that is something to behold. Mrs. Winchester was NUTS!!! There are stairs that go nowhere, 13s everywhere, really a very sinister place. You should go to the Queen Mary – that’s fascinating as well. And they put on a great tea. I forgot to add the Queen Mary on my list, thanks! Yeah, strangely enough I wasn’t too freaked out in the cells, but the courtyard was just so empty. (And windy.) It’s crazy that you and your son heard voices! I’ve wanted to go to one of the night tours for a while now, but have never had the chance. They are always booked and spread out over the calender. So there’s rarely a day I can go. One day, though. The courtyard was a lonely place, and the wind..yes.. I remember the wind. Can you imagine being stuck in that place in the winter, with the fog and the cold, how awful that must have been. I know they were hardened criminals and all that other stuff, but it must have just been miserable. Yeah. You could feel the emptiness in the cells. I imagine that’s how they felt. If not frozen entirely because damn was it cold there in the fall. The winter must have felt like the bottom layer of hell. Of course, it seems like the best time to visit SF is in the winter, at least from my experiences. Went there several times in the summer and we froze our butts off!! But I think out where Alcatraz is, it is always windy and blustery!!! Actually the weather is quite crazy right now, there’s a freak heat wave. I live near the city and if it weren’t for the ever present breeze, I’d be toast. Haha. We live in the Valley and it was quite toasty here too, today. My boys are already bugging us about the air conditioning. AAARGH!!!! Yes, we went out and got little ice cream bars yesterday. I am definitely not ready for the heat this early on. I was thinking yesterday, everywhere else in the country people are getting ready to come outside for the spring and summer, and we are getting ready to hibernate (at least during the day). I hear we may get some rain. Yippee!!!!! I am fascinated with the paranormal as well. Why would anyone want to take parts of this town away? It almost feels like grave robbing. In a sense. Even if there wasn’t a curse, how can anyone possibly rationalize that it is right to take something from a historic site? I don’t understand that type of mentality at all!! It does seem like grave robbing. My goodness, that is so creepy! I’m glad y’all didn’t take anything! Me too, I don’t need troubles raining down on us!! !